Patrick Eaves went through quite the scare earlier this year as he was diagnosed with what was suspected to be Guillain-Barre syndrome, a rare disorder where the immune system attacks the peripheral nervous system. While both Eaves and the Ducks were unsure about his return to the ice this season, the 34-year-old made a remarkable return to action on Wednesday night in Los Angeles and the hometown crowd gave him a pretty awesome ovation. Considering the Anaheim Ducks and the Los Angeles Kings don’t exactly have the greatest relationship since they have their California rivalry, it was an extremely nice gesture by the Kings and their fans to welcome Eaves back to action after his scare. 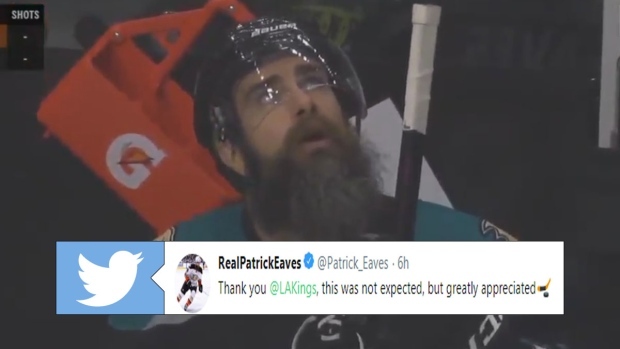 The awesome gesture did not go unnoticed by Eaves.